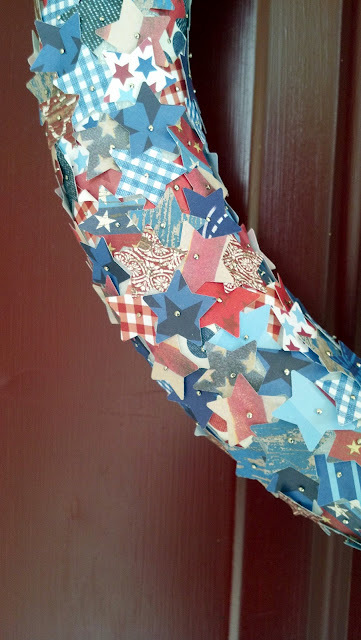 Young Texan Mama: Bloggy Olympics Event #1: Decorating! 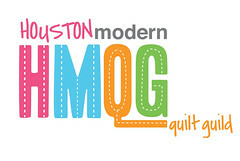 I am super excited about this first event in the Bloggy Olympics! I couldn't figure out what I wanted to do, but a few minutes hours on Pinterest later and I had an idea. 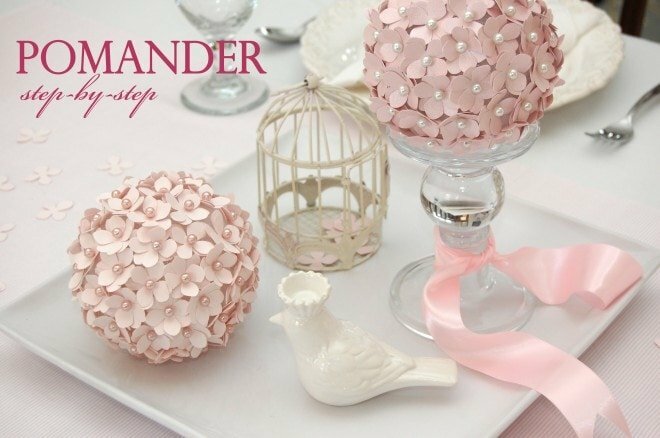 I'm sure most of you by now have seen these adorable flower balls on Pinterest. I think they are super cute for weddings or little girls birthday parties, but I wanted to do something for the Fourth of July. So I came up with the idea to do the same thing but with a wreath and stars instead of flowers and a ball! This was probably one of the easiest projects I have done in a while, except for the fact that my index finger is killing me from all the times I stabbed myself with the pins. 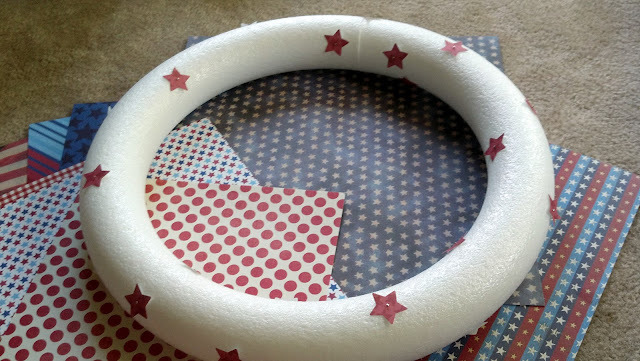 The materials are really simple: foam wreath, scrapbook paper, star hole punch, straight pins, and ribbon. Start punching away and then start pinning away! 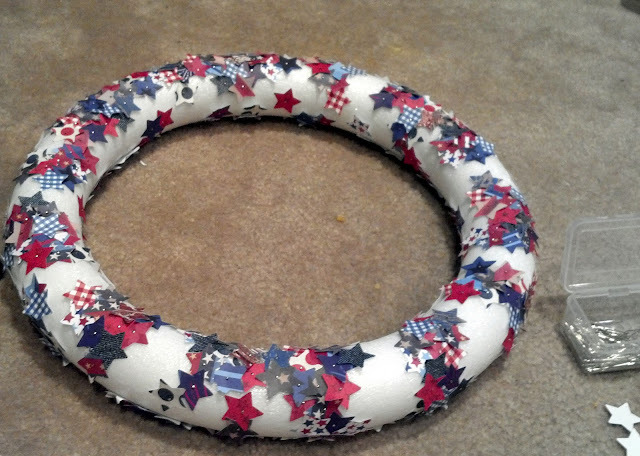 Here's my wreath with just a few stars on it, before my fingers started to hate me. Ready for a close-up! Look at all those amazing stars! Tada! I love how it turned out! Part of me feels like it needs something in the middle, but I'm not exactly sure what. 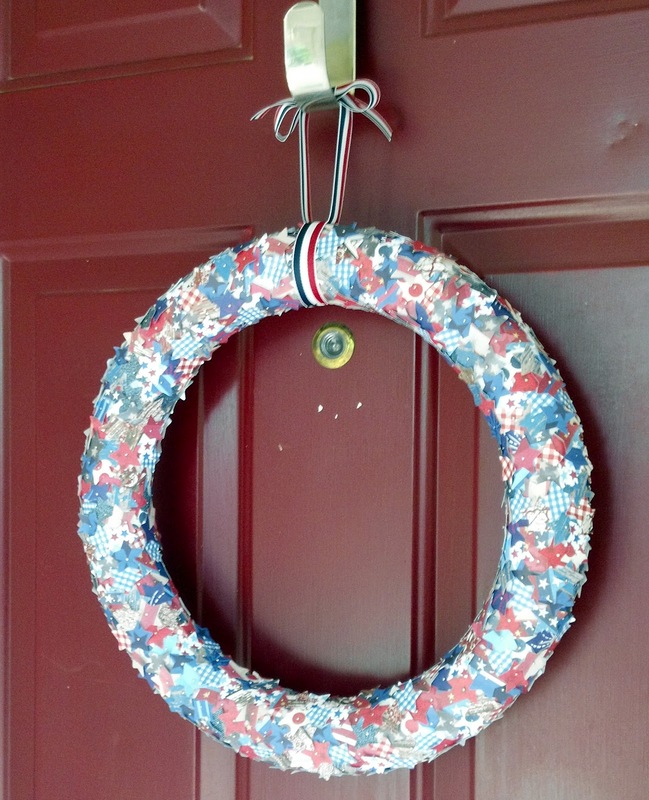 I hope you like my 4th of July decorating project :) I think I should head to Hobby Lobby and hit up their sale section for some lights to go around the door. You can check out my link to this project on Delicate Construction and Hating Martha. Hooray for event 1 of the Bloggy Olympics! I can't wait for event 2! I can imagine your fingers/palms/everything was exhausted after working on that! Great job! Happy 4th and bloggy olypics! Thanks! 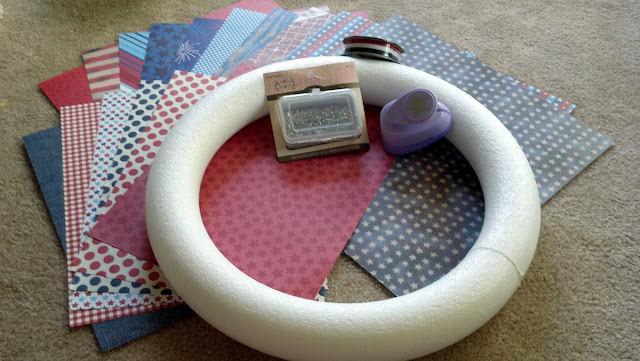 I think it ended up being almost 800 pins that I stuck into that wreath! My fingers still hurt today :( Happy Bloggy Olympics to you too! What a lovely wreath.. WOW..So much detailing.. I just love it.. very festive for the season.. Great blog you have here, very inspiring and beautiful.. I look forward to getting to read more and know more about ya.. I'm stopping in via the Thee Networking Blog Hop and your newest happy follower with smiles.. Hope you can stop in too sometime.. Wishing you a beautiful day.. xo ~ Marilyn via http://www.theartsygirlconnection.com (hop co-host).. Cute, cute, cute! I'm going to have to try to make something similar for my door... So glad I found you on Live. Laugh. Rowe's networking linky party.... Would love to have you visit my site soon! I would recommend using a thimble lol save your fingers some pain :) Thank you for the follow!